My outdoor patio has rubber tiles (made from recycled tires) on the concrete slab. 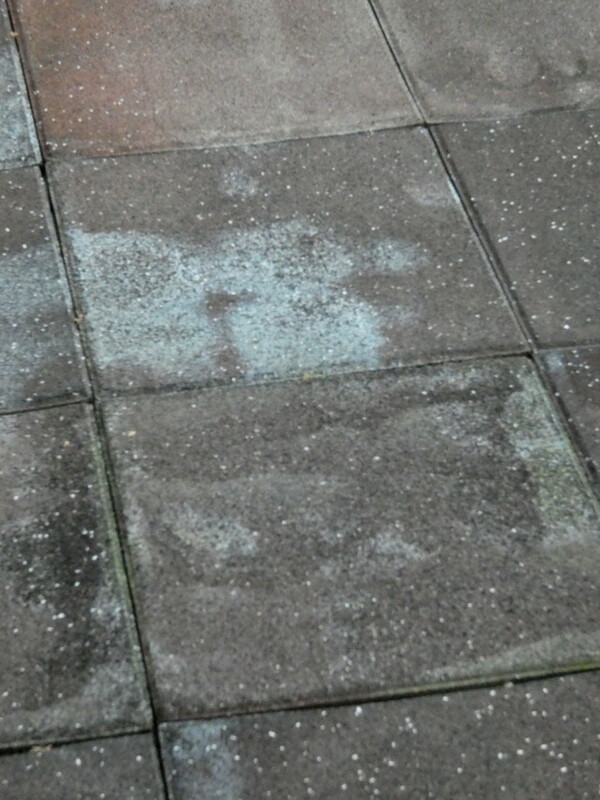 I have used a detergent+water solution in a pressure washer to clean the tiles but a white "stain" remains. What is the white stuff and how can I remove it? Probably minerals from water. you may have some luck with CLR or similar. If that does not work, think about some sort of tire black treatment. Along those lines, the big question is if it's something on the tiles that can be removed or if the finish is ruined and that's what we are seeing. We also can only see one tile, no idea if it's all over many or just one area. If it's just this one spot, could be something was spilled on it and that it's still there. Or could be that it somehow wore out in that spot and that's what it looks like when it turns to crap? What did it look like before cleaning? Like Ed said, if all else fails, you might be able to cover it with stain, paint or similar, but IDK how well any of that will work with rubber tiles. Or if it's just a few, maybe you can move some good ones from someplace that's not noticeable if you have to. Those don’t look like something spilled. They look more like some manufacturing defect given that they are surprisingly square or rectangular within a particular tile. 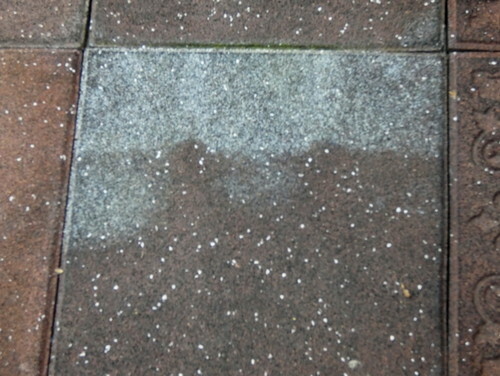 And not that likely to be the result of pressure washing either. I assume you know what company made them? Send the pics to them and ask them what happened and what to do. Some of those pics show a sharp transition, ie one tile is hosed up, the one right next to it is fine. Also within the bad ones, part is fine, then there is an abrupt shift to a bad area. That doesn't look like something got on them or like it's from wear, it looks like a manufacturing defect to me. Did they look like that before power washing? You didn't over do it with the PW pressure, did you? They looked nice when new. Looking at how many and the way they discolored, it is probably something in the mix, not the surface. Have you tried scraping a spot? In a corner take a knife and scrape about 1/32 off and see if it is black or mixed with the discoloration. The tiles were made by Multy Home (in Canada). I've sent them several e-mails and I've used the "Contact Us" form on their website -- http://www.multyhome.com/contact-us -- but they don't respond. 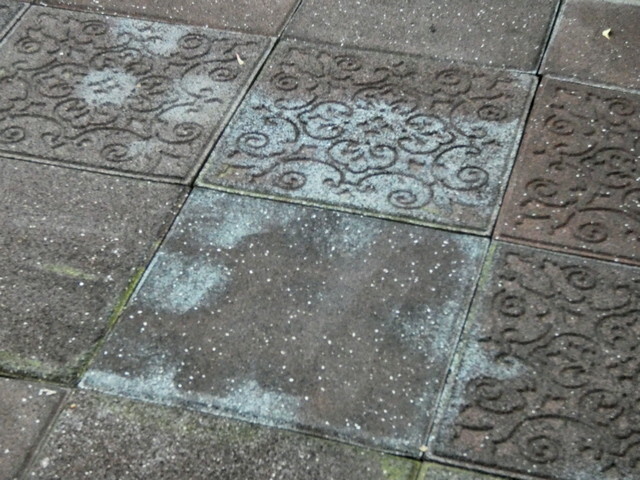 The tiles looked the same before pressure-washing. Where did you buy them and get them installed? I'd take a good one, a bad one and go ask them what's going on. If it's a problem with the tiles, they probably know about it. I wonder if they are still being made? If so, you could get new ones to replace the bad ones. Which is why I always get some extra material with things like that, just in case. But if it is a problem with the tiles, it's probably only a solution for some number of years, before more and more of them go. I've come to the conclusion that pavers are probably the best option for this kind of thing. I had a large stamped concrete patio poured, after researching that. Nobody said that the finish on those also wears off after ten years or so, but it does. And you have to keep sealing it every few years to try to keep it looking good. At about 15 years, I wound up painting mine. It still looks good, you have the pattern, but it doesn't have the variation that makes it look more like real stone anymore either. Looks suspiciously like it’s a known problem if its been weeks since you asked them and they are hoping you will give up and go away. I just drive around until rain or puddles wash the white stains off. Re-laying rubber tiles (made from recycled tires). White grout in Black floor tiles. Is there a problem? Removing bottom row of cement roof tiles, to repair felt. Tracking down 11cm x 11cm white tiles? Removing Wood Stain From A Chair ? Best sort of glue for rubber floor tiles? Skim plastering over ceramic tiles? White stain/paint over "tung oil"